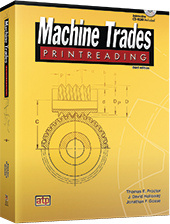 Machine Trades Printreading presents a thorough foundation for understanding the symbols, practices, and concepts used in prints created for manufacturing and machining processes. This text/workbook explains how parts made in a machine shop are represented in two-dimensional drawings. Topics focus on the representation of objects in various views and the specification of sizes and shapes of object features. This new edition references the latest ANSI standards for printreading symbols and object representation and adds new information on tolerancing and precision measurement. Numerous trade competency tests throughout the book are based on practical manufacturing prints. End-of-chapter tests are designed to strengthen the printreading skills and knowledge from each chapter. The final chapter's collection of trade competency tests challenges the learner to interpret prints using knowledge from all chapters. For additional resources, click here to access the ATPeResources.com web page for this product. Quantity: Quantity must be greater than zero. Item added to cart successfully. Enter quantity for item(s).